A fun collection of incredible facts for curious kids! 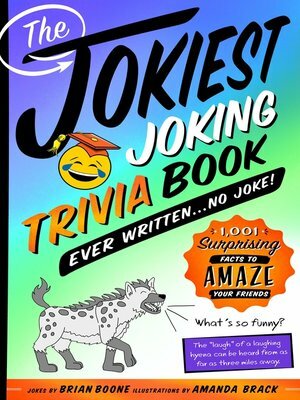 The Jokiest Joking Trivia Book Ever Written...No Joke! is chock-full of amazing facts about everything from food to travel to science to history! It's nothing but fun, with hand-drawn original illustations on nearly every page. Kids will love to impress their friends with their cool knowledge, and parents will be happy their kids are learning something. There are exactly 206 bones in your body. your hands, toes, fingers, and feet. Think how cold you are when you forget your winter coat. Now consider how cold you'd be without your skin. Your skin weighs the same as four heavy winter coats. BRIAN BOONE is the author of I Love Rock n' Roll (Except When I Hate It) and many other books about everything from inventions to paper airplanes to magic to TV. He's written jokes for lots of funny websites and he lives in Oregon with his family.